The upcoming PC re-release of Final Fantasy VII will not use any sort of microtransaction-based system, publisher Square Enix told me today. Last week, when Square Enix announced the upcoming Final Fantasy VII re-release, the company said it would introduce a new feature called the Character Booster that allows players to boost their characters' stats and finances "all with the simple click of a button." The vague wording led many reporters—myself included—to speculate that it could use some sort of microtransaction-based system. So I reached out to Square Enix for clarification. "No, the Character Booster will not cost real money to use," a Square Enix representative told me. "We'll have final pricing info on the game to share soon, but we can confirm that there will be no microtransactions for the upcoming rerelease of Final Fantasy VII on PC." There's no release date for the upcoming game yet, but Square Enix has said it will also include achievements and cloud saving. 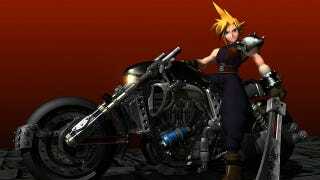 Feel free to insert your own joke about Cloud saving and/or Aeris saving and/or Cloud cloud saving.